The author has written many tales based on the character of Peter. In this book O’Brien has focused on Halloween with its spells, witches, goblins, vampires, zombies and the like. 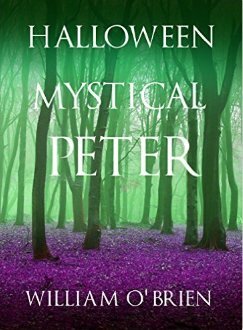 He has provided the reader with a series of dark poems that evoke images of the best and worst Halloween has to offer. O’Brien employs his creative talents with a skill in using descriptive language including rhyme, alliteration, and onomatopoeia to evoke fear and dread in the souls of readers. At the end of the book, O’Brien adds a prose story about Charlie Featherwick. He lives in a strange town called Temptus Vale whose inhabitants include a witch named Mrs. Cruelmonger. When a group of children play a prank on her on Halloween night, the stage is set for an adventure that none of them will ever forget. 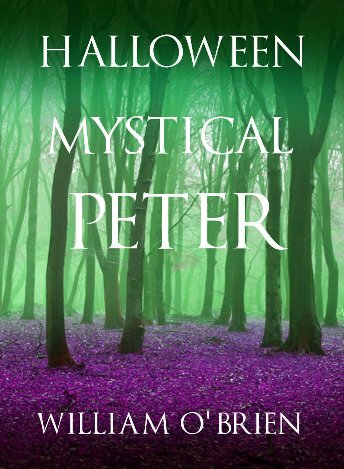 This collection is a perfect choice for a Halloween party read. Imagery is clear, crisp and really frightening. Fair warning for children who are easily spooked. Targeted for readers who are eight to eighteen, but not for the fainthearted. The author has written many tales based on the character of Peter. In this book O’Brien has focused on Halloween with its spells, witches, goblins, vampires, zombies and the like. He has provided the reader with a series of dark poems that evoke images of the best and worst Halloween has to offer. O’Brien employs his creative talents with a skill in using descriptive language including rhyme, alliteration, and onomatopoeia to evoke fear and dread in the souls of readers. 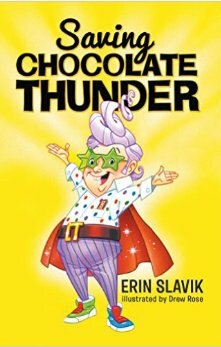 At the end of the book, O’Brien adds a prose story about Charlie Featherwick who lives in a strange town called Temptus Vale whose inhabitants include a witch named Mrs. Cruelmonger. When a group of children play a prank on her on Halloween night, the stage is set for an adventure that none of them will ever forget. This collection is a perfect choice for a Halloween party read. Imagery is clear, crisp and really frightening. Fair warning for children who are easily spooked. Targeted for readers who are eight to eighteen, but for the fainthearted it is more suited for teens and young adult audiences. 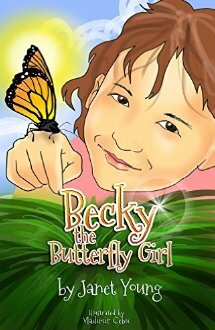 Charming picture book featuring a child named Becky who guides her young readers on a tour of her butterfly garden. Becky’s garden is designed as a wild flower garden with water features, a pond filled with fish, birdhouses and bee houses, but most importantly it provides a safe haven for butterflies. Monarch butterflies are quickly disappearing due to the rapid expansion of roads and cities. Becky’s tour leads us through cone flowers, monarda, asters, goldenrod and milkweed. This garden is free of pesticides and chemical fertilizers. The monarch butterflies lay their eggs on the underside of milkweed leaves; which are the only kind of food they eat, but which are poisonous to humans. Once the eggs become caterpillars, Becky’s dad carefully moves them to a cage where they continue to feed on milkweed leaves until they form a chrysalis. After about ten days they emerge as butterflies, when they are carefully released from their cage. The illustrations depict Becky and her beautiful garden plants and animal friends. Story is based on Becky Lecroy, a genuine character whose parents raise monarch butterflies in their own wild flower backyard. Nice way to teach children about the life cycle of the monarch butterfly and the importance of conserving the species. Targeted for grades preschool through grade four, this book should be included on classroom shelves in elementary school as well as those in libraries and environmentally conscious parents who might want to undertake the project on a smaller scale. I personally plant milkweed in my tiny garden to encourage monarchs to settle there. Sadly, in recent years, I have noticed a dramatic drop in the lovely creatures that used to fill my backyard. Interesting nonfiction book especially suited for students in the elementary or middle grades. I will readily admit that I learned quite a bit from this thirty page book so I do not hesitate to recommend it for adult readers who have an interest in the subject. Royalty free common stock photos enhance interest and add an additional dimension. Originally rats came from Australia and Asia, but are now found anywhere in the world. Readers learn that there are 60 types of rats, the brown rat and the house rat being the most common. Topics covered in the book include their behavior and habits, how they eat, grow and multiply, wild and pet rats, and the Gambian Pouched Rat. 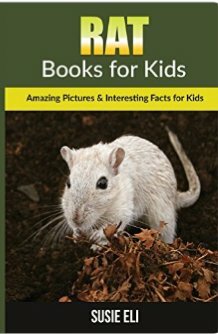 Some interesting facts that I gleaned from the book include: a group of rats is called a mischief, males are bucks and females are does, rats are smart and make good pets, happy rats might roll their eyes or make grinding sounds with their teeth, and one female may have as many as 2000 babies in one year! While rats are often seen as a nuisance, the Gambian Pouched rat can detect deadly land mines and diagnose a patient with tuberculosis. Animal lovers will enjoy learning about this often maligned animal. Great resource for a science research project or report. Recommended especially for children in third through fifth grade. 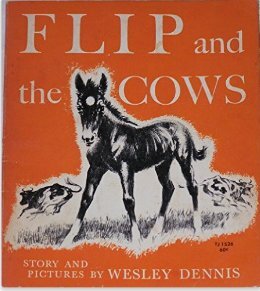 Fascinating read for adults as well as children. Available in kindle and paperback. A very well-written novel that traces the experiences of a Mexican-American eighth grader struggling to fit into an exclusive private school and falling in love for the first time. Paco Jones is taunted by his classmates as Taco Jones; he is unattractive, nonathletic, uncool and poor. Paco’s biracial parents are determined to see that their son has a chance of success and struggle to give him a good education. Paco wants to gain the acceptance of his peers and please his parents. To complicate his situation further, Paco falls desperately in love with a black girl named Naomi, who is dating Trent, one of the popular jocks at school. When Naomi becomes impressed with Paco’s intelligence and honesty; she takes him into her confidence and reveals her true feelings about Trent. Strangely enough, Trent also enlists Paco’s help in his effort to woo Naomi. Paco becomes trapped between his two friends, and almost gets expelled in the process. 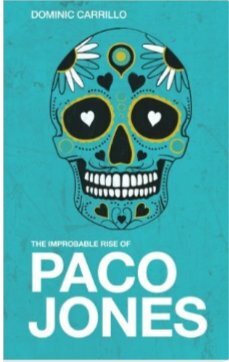 Despite the trouble in which Paco finds himself, he remains true to his principles revealing his real character. 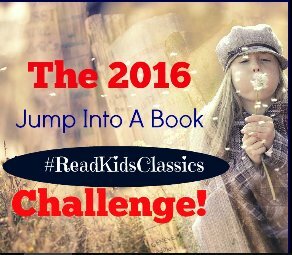 This tale deals with many issues that young adult readers face. Paco faces racial discrimination, economic insecurity, first love issues and parental child responsibilities. He winds his way through a myriad of difficulties, only to find out that there is not always a simple solution or a rosy ending. Characters are well- developed multicultural, and multidimensional; readers empathize with Paco, find a strong female role model in Naomi, and discover the strengths and flaws in others like Trent and Mr. Holiday. As a bonus, the author/teacher provides discussion questions that align with the US common core standards. This book also provides a flashback for adult readers who may have forgotten those turbulent junior high days. Recommended for readers age twelve and older.